Vieja Valley Kicks Off Its First Bike/Walk to School Day! Kids check in at school and receive a healthy snack, sticker, and enter their name in a raffle for a chance to win a big prize! On Thursday, February 9th, Vieja Valley Elementary kicked off their monthly Walk and Bike to School Day! On the 9th of every month, kids, parents, and teachers will ditch their cars to walk and bike to school! They had a great turnout this month, with loads of kids walking and riding their bikes to school. Many families who typically drive to school, rode their bikes instead. Some came from as far as the LaCumbre area, biking over the LaCumbre overpass and onto Modoc road, over a mile away! Families enjoyed the morning air and exercise, and it was a great opportunity to spend time with their kids before heading off to work! Kids who participated in Walk to School Day got a healthy snack of granola bars and orange juice, a sticker, and entered their names in a raffle for a chance to win a big prize! The class with the highest average participation will also receive a treat. We’d like to thank Sasha McGibben, a mom who organized the first event, and will be organizing all of the monthly Walk/Bike to School Days! 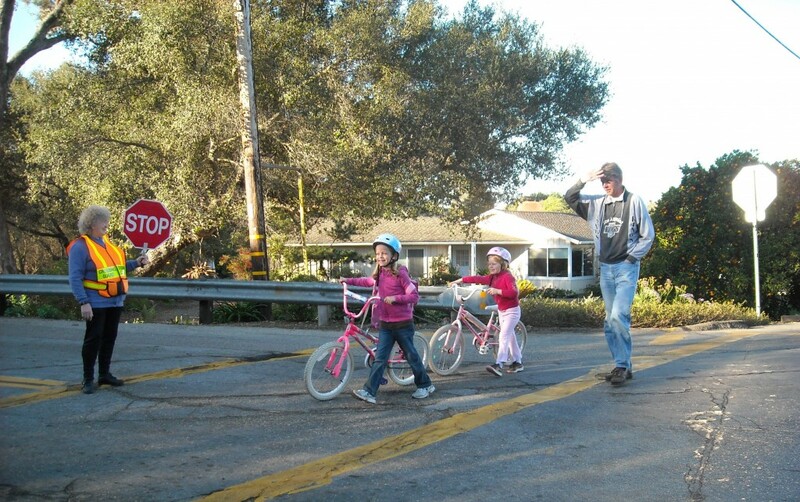 With the aid of the crossing guard, kiddos walk their bikes across the crosswalk to get to school! In addition to Vieja Valley’s Walk/Bike to School Day, COAST’s Safe Routes to School Program is really taking off this year! We’re expanding into schools we’ve never been before including those in Carpinteria. We also started pilot programs in Isla Vista Elementary and Franklin Elementary. We are so excited, and can’t wait to share our successes with you!